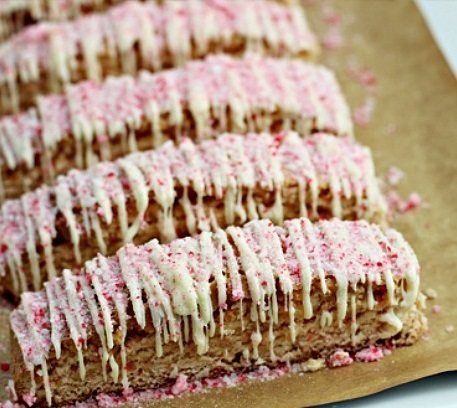 Biscotti allo Zenzero is gingerbread biscotti. 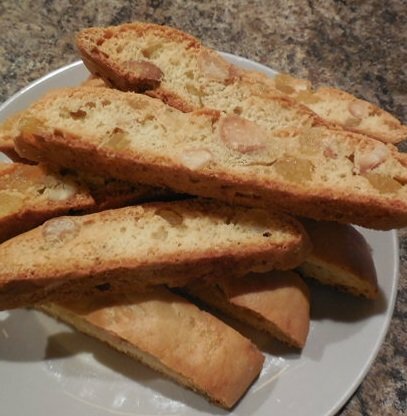 These spicy Italian cookies are the perfect accompaniment to an espresso, cappuccino or coffee during the holiday season! When baking they will fill your home with the scent of gingerbread. Gingerbread is a mixture of spices such as cinnamon, cloves and nutmeg, with a strong prevalence of ginger In the U.S. it generally used for making Christmas cookies and gingerbread houses. 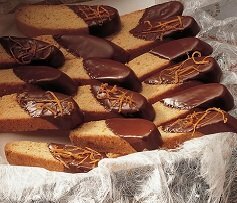 In Italy Gingerbread is prepared and used to make biscotti during the Christmas holidays. When decorated with colored glaze they become a welcome addition to any Christmas party. 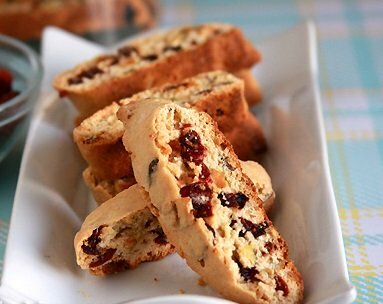 Tips and Trick for the ultimate Biscotti allo Zenzero. Use dark molasses, if you prefer a more intense molasses flavor. These really benefit from some glazing. If you what a stronger ginger kick try using real ginger, crystallized or fresh. If you can't find Ginger Extra at the market you can buy it from, one of my favorite online stores, "OliveNation"
Place one oven rack in the middle of your oven and preheat oven to 350 degrees F.
In a large bowl, combine oil, sugar, ginger, cinnamon, nutmeg and cloves, beat at medium speed, scraping bowl often, until well mixed. Add eggs; continue beating until well mixed. Add molasses; continue beating until well mixed. Divide dough in half. Shape each half into 12-inch log on lightly floured surface. Place logs 3 inches apart onto prepared baking sheet. Flatten logs slightly. Place into over and bake 22-25 minutes or until tops are cracked and logs are golden brown. Remove from oven; cool 15 minutes on cookie sheet. Reduce oven temperature to 325°F. Carefully place logs onto cutting surface. Cut into 1/2-inch diagonal slices with serrated knife. Place, cut-side down, onto ungreased cookie sheets. Return to oven. Bake 9 minutes; turn slices. Continue baking 5-7 minutes or until cookies are dry and crisp. Cool completely. Divide the icing into as many small bowls as colors you want to use and add food coloring to each one blending gently. Put glaze in Ziploc bag and nip the corner very small. Decorated to taste. When coating has hardened, store in airtight container to maintain freshness.